Marie Stopes Belfast centre will provide abortions "within NI legal framework"
A LEADING sexual health organisation has confirmed it will be providing abortions privately when it opens its first centre in Northern Ireland next week. Marie Stopes told The Detail that any pregnancy terminations conducted at its new premises in Belfast would be performed within Northern Ireland’s current legal framework for abortion. A spokeswoman said: "Medical abortion up to nine weeks’ gestation will be available at the centre. The new centre opens next Thursday, October 18. In the UK, Marie Stopes International has a network of centres delivering services in abortion, female sterilisation, vasectomy and health screening. In 2009, the organisation delivered services to 104,572 women and men and offers many NHS funded services as well as private appointments. The Detail learned about the new Belfast centre earlier this week and contacted Marie Stopes for a comment. We were told that they had been planning a media briefing for next week. The organisation has now issued an embargoed press release to news organisations which permits them to report tomorrow on the centre’s opening. It is understood that former Progressive Unionist Party leader Dawn Purvis will be Programme Director at Marie Stopes Northern Ireland. In response to questions put forward by The Detail, Marie Stopes has confirmed that the centre will be based in central Belfast and that it will open next Thursday. A wide range of sexual and reproductive services will be available from the centre including: short and long-term contraceptive options (including condoms, injection, IUD); emergency contraception; HIV testing; STI testing and treatment; ultrasound scanning; and medical abortion up to nine weeks’ gestation. It will be staffed by a centre manager, two doctors, a psychiatrist, a nurse and a receptionist. We asked if medical abortions will be offered at the Belfast centre and a spokeswoman said: "Medical abortion up to nine weeks’ gestation will be available at the centre. Women will be able to self refer to the centre by by calling a 24 hour helpline, which is staffed by trained health professionals. GPs will also be able to direct women to the services. The spokeswoman added: "The centre will provide a safe space for women to discuss all their options, and will offer information to a range of services in England, as well as options in Northern Ireland if women decide to continue with the pregnancy or alternatively look at adoption. The organisation already has a clinic in Dublin called Marie Stopes Reproductive Choices. This “specialist private sexual health clinic” provides a wide range of services including abortion help and advice, information about abortion clinics in England, unplanned pregnancy counselling, cervical smear tests, contraception and sexually transmitted infection testing for men and women. The Reproductive Choices website states that women who opt to travel from the Republic of Ireland or Northern Ireland can currently access a medical abortion service in England or Wales which can be completed within a day for a fee of €440 if they are between six and nine weeks pregnant. Two tablets are given six hours apart. Marie Stopes says that thousands of men and women from all over Ireland have already visited the clinic for the specialist service. 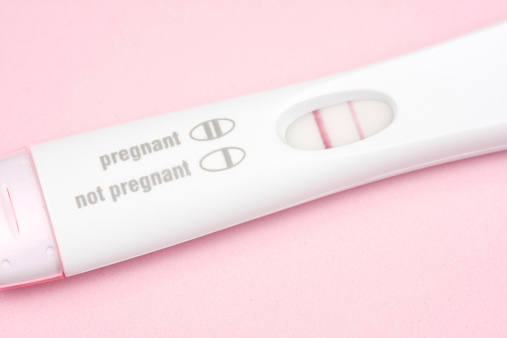 Pregnancy testing is free and unplanned pregnancy counselling is €50. The morning after pill is €40. The law relating to termination of pregnancy in Northern Ireland is different from that in England, Wales and Scotland and much more restrictive. Abortions can only be carried out in Northern Ireland where continuing with the pregnancy would threaten the life of the women or would have a serious permanent or long-term effect on her physical or mental health. In 2009 the Department of Health, Social Services and Public Safety (DHSSPSNI) published a document which, for the first time, provided guidance to health professionals in Northern Ireland on terminating pregnancy. However, later that year the High Court ruled it did not properly cover counselling and conscientious objection issues. A judge held that the guidelines were misleading and should be withdrawn for reconsideration. Since then a fresh public consultation process on counselling and conscientious objection was carried out as part of the redrafting. Last month, the Family Planning Association (FPA) was granted leave to seek a judicial review of the Department of Health’s decision not to publish information on terminations in Northern Ireland. A full hearing is listed for January. A 24-week limit for abortion applies in England, Wales and Scotland. Health Secretary Jeremy Hunt said recently that he personally favoured a move to halve the limit from 24 weeks to 12. However, Prime Minister David Cameron said in response that he had no plans to bring in new laws governing when abortions can take place. HOW MANY NORTHERN IRELAND WOMEN ARE HAVING ABORTIONS? In August this year, Health Minister Edwin Poots made a statement to the Northern Ireland Assembly following an audit of abortion information collected by the health trusts. The Minister confirmed that 416 medical abortions and 262 terminations of pregnancy took place in Northern Ireland between 2006/7 and 2011/12. Mr Poots said that “termination of pregnancy” is the definition applied to any patient who has a live pregnancy terminated for ”legally acceptable, medically approved conditions”. He said it was a subset of the term “medical abortion” (which includes re-admissions with retained products of conception following a previous termination of pregnancy and missed miscarriages). The legal ban on abortions here – except in exceptional circumstances – does not prevent women travelling to other parts of the UK, or wider afield, to terminate their pregnancies. A total of 196,082 abortions were carried out in England and Wales in 2011 and this includes just over 1,000 women from Northern Ireland. The Guardian Datablog provided a detailed breakdown of the UK’s abortion statistics last weekend – click here to read the article and to see a breakdown of the women’s ages, region, ethnicity and reason. Almost half of all of the abortions (49%) in England and Wales were to women with partners, 26% were to single women and 16% of abortions occurred within marriage. 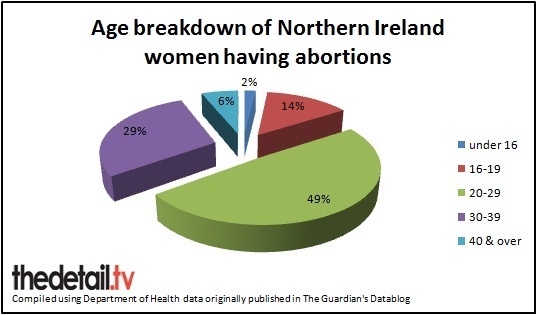 Almost a third of the 1,007 Northern Ireland women who had abortions in England and Wales last year were in their 20s with 494 women in this age category having an abortion, 291 women were in their 30s and 62 were aged 40 or over. In the younger age brackets, 19 were aged under 16 and 141 of the women were teenagers aged between 16 and 19-years-old. 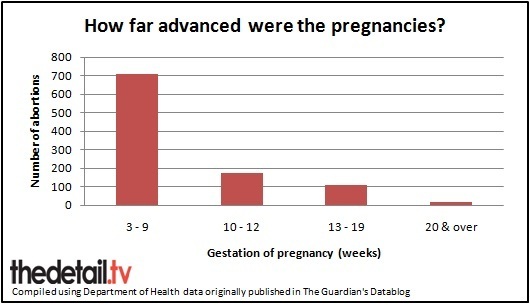 The vast majority of the pregnancies terminated by Northern Ireland women were in their early stages with 70% (709) between three and nine weeks gestation. Only 16 pregnancies (2%) were 20 weeks or over, 174 were between 10 and 12 weeks and 108 were between 13 and 19 weeks gestation. Another 4,149 women from the Irish Republic also travelled to England and Wales for abortions last year.